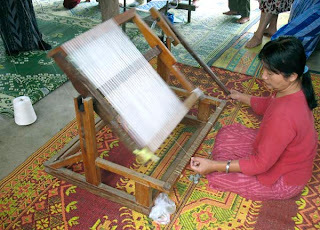 October 25 found our textile group gathered for a daytrip to Studio Naenna's eco-weaving workshop south of Chom Thong for a demonstration of weft ikat, as well as other weaving they are doing in silk and cotton. Patricia Cheesman's Studio Naenna is justifiably well known for their wearable art, conservation of traditional textile techniques and patterns, and for Patricia's innovative ikat designs. 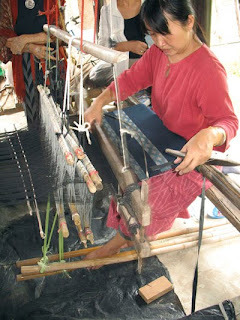 What I hadn't realized is that they are producing weft ikat textiles, which are not native to this part of Thailand, thanks to the expertise of weavers brought from Isaan over twenty years ago. 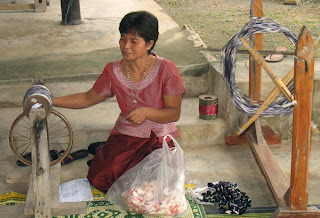 Her master weaver is Viroy Nanthapoom, who hails from Surin (shown here winding ikat wefts). as well as the tying process. 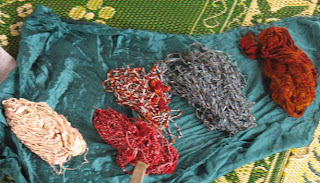 It is a very complex, elaborate method of patterning fabric, and entails tying dye resists on the yarns before they are woven. The resists determine the pattern, and are re-tied for each color. Then the yarns are put onto the shuttle and woven as the weft, with alignment carefully achieved by the weaver. The Thai tubeskirts from Isaan are famous examples of this type of textile, as are the richly colored and patterned silks from Cambodia. Studio Naenna uses this technique to produce beautiful scarves, wall hangings and shawls for their shops, and for special orders. 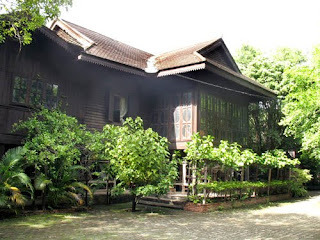 We later visited Ban Rai Pai Ngam, further down the road. 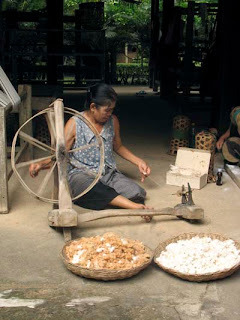 Now it is widely used in the cottons produced in the Chom Thong area. We were treated to demonstrations of the process of making cotton into thread prior to weaving: ginning the seeds and impurities out, then rolling it so that it can be spun; spinning with a wheel; then winding the yarns on a 'niddy noddy'. After satiating our textile appetite we stopped at Kao Mai Lan Na Resort on the way back for some snacks and libations. 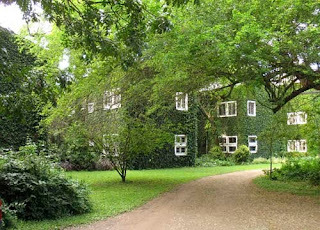 Formerly a site comprising acres of tobacco-drying barns, much of it has been converted into a lovely resort with the vine-covered barns renovated as guest rooms. Their attractive restaurant is just off the main road, at km marker 29, making it an ideal rest stop. I finally did it! I went to Studio Naenna and learned how to weave on a backstrap loom. It felt like joining a sorority(sorry guys...), at least here, where weaving is still practiced as the most prominent women's art form. Join me in an armchair version of this rite of passage. Day One - The first order of business was choosing my colors from a large selection of beautiful, naturally-dyed (by Studio Naenna) skeins and balls of commercial cotton threads- several shades of indigo, a soft sage green, two different brick reds, and a coffee color. We then took the chosen ones and submerged them in a starch mixture made from a large amount of heated water into which was dissolved a couple spoonfuls of taro flour- (rice flour can also be used). 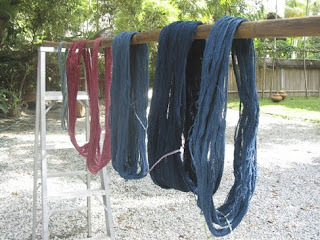 The skeins were stirred gently in the mixture to get it to adhere to all the threads, and then they were squeezed out and hung to dry overnight. Coating the thread is important especially for the warp yarns as it strengthens them for the rather taxing weaving process. 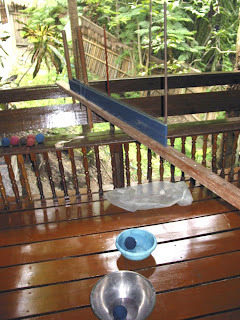 Days Two & Three - After drying, the threads are wound into balls, which are easier to work with in the weaving process. (Patricia noted that not all groups do it this way, nor is this done with silk.) 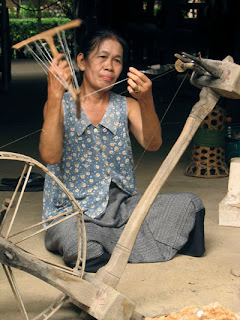 The Karen use a handmade thread winder, called a "swift", comprising a 'wheel' made of string stretched between two large, springy 'X's made of bamboo slats. This contraption pegs into a 'U' shaped frame that sits on the floor and has a heavy, weighted base. Two skeins are positioned next to each other and a thread is drawn from each skein thus forming a 2 ply yarn. This process was the most frustrating for me: the threads stuck together and would occasionally break and frequently become tangled. I spent hours making just one small ball and could see myself doing this for days! 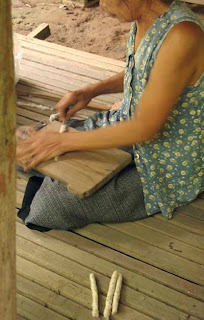 Khun Saeng pitched in overnight and in a couple of days there were enough wound balls to begin the warping process. Day Four - Creating the warp was something I was most curious about- I just couldn't fathom how the threads could be kept straight and ordered, nor how the heddles were created. But it all became known in short order! The equipment is very basic and the process is quite ingenious. We started with the warping board- simply a long two-by-four with holes of different sizes drilled along its length, into which were inserted bamboo and wood poles of various diameters, tho not all the holes were used. 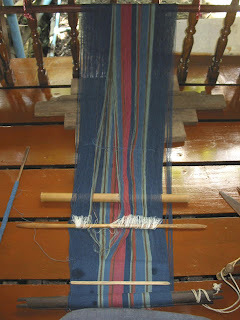 Starting on the left, is the end stick closest to the weaver when on the loom, followed by the slim "starting stick" which is where the textile really begins, followed by a fat bamboo tube around which the heddles would be strung, followed by a slim "shed" stick, and last was a tall rod which was the other end. The placement of the end sticks determines the length of the piece and the height of the sticks provides a limit to the width. 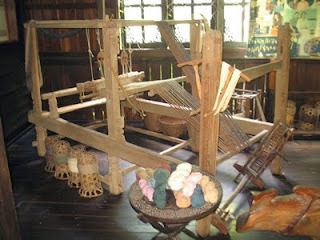 To form the warp, yarns from two balls were tied together and a process of looping and winding around the sticks formed the two different sets of warp yarns which would then form the sheds thru which the shuttle passes on the loom. 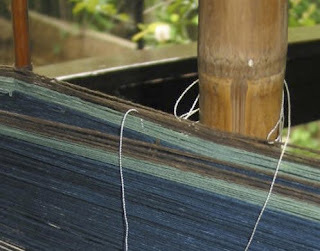 This warping process creates a textile with a continuous warp: the threads must be cut to make it flat and it then opens to twice the length on the loom. The heddles are formed with a dexterous movement that incorporates a loop of silky white thread, with each loop holding a warp yarn. These are used on the loom to suspend and then pick up each of the sets of warps. It's complex and simple at the same time! To change colors, as I did, one simply tied in the end of a new color at the beginning stick, continuing the process to a desirable width, thus forming what will be stripes on the finished textile. 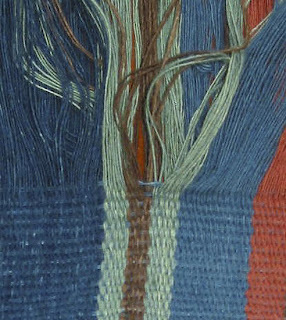 This method of weaving creates a warp-faced weaving, meaning the wefts are hidden by the warp, so the colors of the warp are the visible colors on the textile. The 'back' of the warping rack was actually the top, or front, of the textile. The heddles are plainly visible on the back. I didn't finish it all in one day, so left it overnight and 'wrapped' it up the next morning. This is not advisable. The best way to do it is to finish the warping in one day and then get it onto the loom. 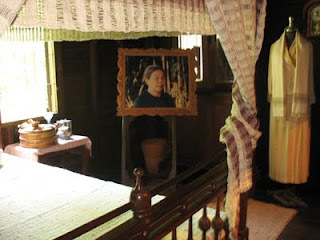 Languishing overnight allows it to move and shift in response to humidity, of which we have much at this time of year. And it did create some problems in the tension once weaving began. Live and learn. 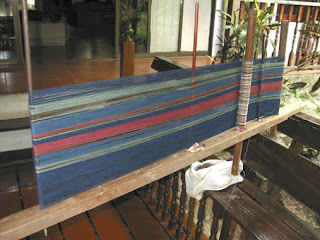 Day Five - Once the warping was finished, Saeng and Lamorna showed me how it is transferred to the loom. It's really just a brilliant process of substituting sticks! For the heddles a smaller rod was inserted into the bamboo warping tube and the bamboo slipped out (above). Other rods, such as the starter stick, were kept. 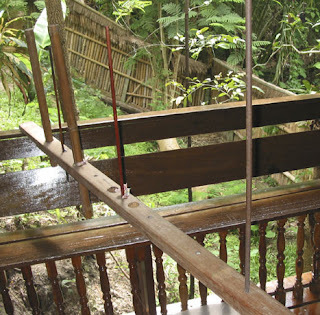 The end closest to the starter stick was sandwiched between two takeup sticks, and the opposite end was fitted with a long, fat wooden rod that can be attached to an immovable object (Saeng uses the railing balusters). Now we're ready to rock n' roll! The backstrap comes into play here, and is an important piece of equipment. 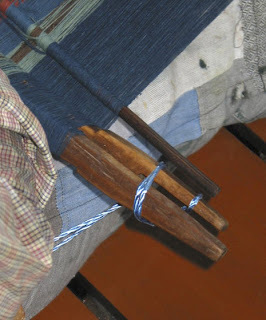 Going around the back of the weaver's waist, it connects via cords on each end to the takeup sticks, and must be positioned correctly, with adequate room to move and adjust the tension, but not too much. 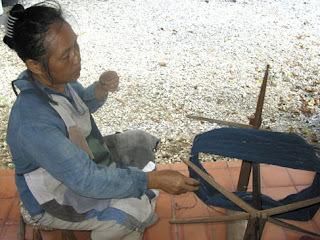 The other important aspect to the tensioning is the position of the weaver's feet. 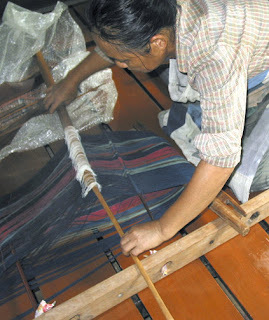 Some backstrap looms, such that of the Meifu Li, utilize rods with foot paddles, around which the warp is looped. The weaver's leg length pretty much determines the length of the textile, tho some of it can be wound round the takeup sticks allowing a longer warp than the length of her legs would imply. 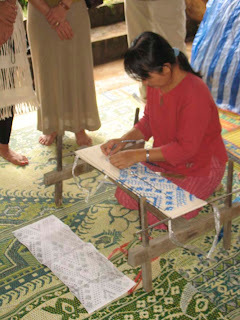 The Karen (Saeng's ethnic group), and other groups attach the warp end to something immovable, in front of which is placed something that the feet can push on to change the tension. The feet work in tandem with the weaver's back, as she leans forward and back to make certain movements allowing her to open sheds and insert the shuttle. 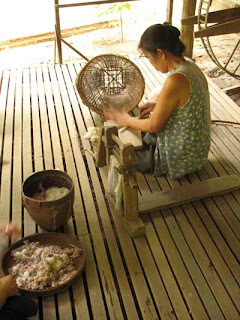 For a simple textile like mine, the weaving part was a basic matter of getting the sheds opened up completely and inserting the shed stick without missing warp threads. Then the shuttle carrying the weft thread is passed thru the opening of the sheds and the weft is beaten down with the sword stick. This is a dual purpose piece of equipment: its pointed end allows it to move thru the shed, parting the warps, and then turned parallel to the weaver, it props open the shed; after the shuttle goes thru the shed, it is turned flat and used to beat the wefts tight. 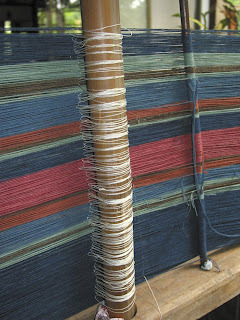 When a warp thread, or two, is missed it results as a small flaw in the weaving, as shown here. Other easy to make mistakes (I made them all, and continue to do so) have to do with tensioning, and with getting the weft threads beaten in a tight and uniform manner. For those who subscribe to the theory that handmade articles should have a flaw to show the human touch, this piece will be full of humanity! We've just posted a page of eye candy from Java and Sumatra: antique and vintage batiks in luscious colors, rich pattern, and a variety of prices. The one pictured above is a 'Hokokai' that was made during the Japanese occupation of 1942-5. 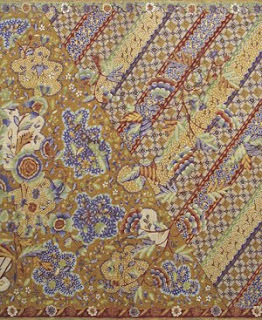 These batik cloths were made when cotton was scarce and had to be brought in from Japan. Ours exemplifies the use of contrasting floral and geometric patterns in unusual color combinations. Drawn by hand ('tulis'), the wild pattern belies the seriousness of the times. Check out our page for more examples of this exuberant textile art. We're still here, but have been having internet problems which make any posting efforts frustrating. Most recently, we have been catching up after Robert's return from the US where he was able to properly celebrate his mother's 95th birthday. We both feel so fortunate that she's still around to share her wisdom and good humor- we only wish we weren't so far away. And this week, our thoughts have been with those in Padang, Sumatra. It's been 12 years since we were there, but the memories are still quite fresh. It is the gateway to West Sumatera and was the embarkation and departure point for our interesting adventure into Minangkabau country. Lake Maninjau, and Lake Toba to the north, are reminders of the earth's past volatility in this region, and sadly this earthquake brings it home in the present.